A phenomenology of the preparation and eating of thoroughly simple food. 1. Open box of cereal with fingers, using knife or scissors to assist in opening internal plastic bag, if any. 2. 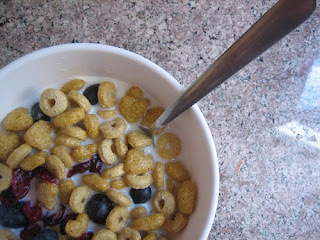 Pour desired amount of cereal into waterproof bowl (porcelain or glass is ideal). 3. Open carton of milk. 4. Pour sufficient milk to barely cover cereal into bowl, taking care not to hit pieces of cereal at a bad angle causing unexpected and messy splashing. 5. Serve immediately and consume cold. do i have to use milk or can it be any liquid? cali: milk is preferred, though vegans or those with lactose intolerance may substitute non-dairy milks as indicated in the recipe. Non-dairy milk can be substituted in a one to one ratio. thanks for the tip. i was going to use water because i saw it in a movie once. never again.